Land Rover and international wildlife charity, Born Free Foundation, have opened a vital new lion enclosure and education centre in Ensessakotteh, Ethiopia. a base and classroom facilities which will help the team at Ensessakoteh carry out environmental education activities that include interactive games, role-playing and writing workshops, all focused on educating the next generation on the importance of conversation and care for animals. Marking the significance of the initiative, actress and legendary conservationist, Virginia McKenna OBE; His Excellency, the former President of the FDRE, GirmaWolde-Giorgis; DawudMume Ali, Director General of Ethiopian Wildlife Conservation Authority; and Adam M Roberts, CEO of the Born Free Foundation and Born Free USA were in attendance demonstrating their support. Ensessakoteh, meaning 'Animal Foot Print' in Amharic, offers sanctuary to over 70 wild animals who have either been orphaned or confiscated from illegal trade or ownership. The centre is able to house the wildlife within 77-hectres of protected wilderness whilst offering a peaceful haven for visitors, allowing them to enjoy the beautiful surroundings that still retain their natural environment. "The redevelopment of the centre at Ensessakotteh is a project that Land Rover and Born Free have been working towards for some time. The facility will provide a protective environment to care for the wildlife. The centre will also play a vital role in educating young people about the importance of conservation and will make a real difference by spreading awareness about how people can adapt their lives and attitudes to ensure a sustainable future for man and wildlife alike," said Mark Cameron, Jaguar Land Rover Global Brand Experience Director. Adam M. Roberts, added, "The Born Free Foundation works dynamically and diligently the world over to conserve wildlife, stop suffering, and rescue individual animals in need. We can only accomplish our significant successes year after year with the strong support of vital partners such as Land Rover. 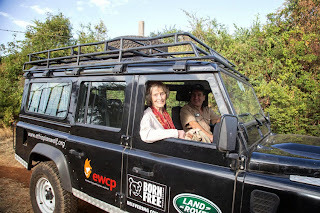 Ethiopia's wild animals are more secure because Born Free and Land Rover are working together to ensure their well-being, and that is a partnership of which we will forever be proud."